Recently my family and I were invited on a press trip for the new Carnival Sunshine and let me tell you … Good Times!!! We started our journey by flying into Barcelona. After a 9-hour flight, we met with our prearranged shuttle transfer via Carnival — within no time we were at the port and ready to check in. 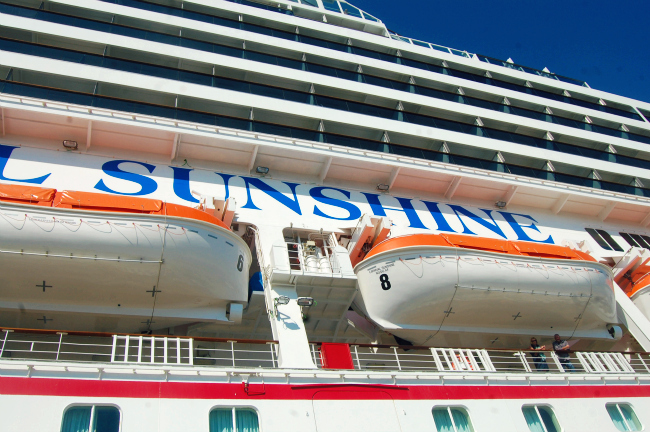 My first impression of Carnival Sunshine was “Wow”! For a 17 year-old ship (Known as Carnival Destiny before its $500 million refurbishment) the layout was really fantastic. Lots of new restaurants, bars, and entertainment — the ship is like a mini Carnival Breeze. We will get to all of the new additions in later posts… I promise! The staff was amazingly friendly and helpful, something I’ve come to expect over my last few years of traveling with Carnival Cruise Lines. We had a few hours to work with before the ship left port, so we decided to head into Barcelona to see the sites. 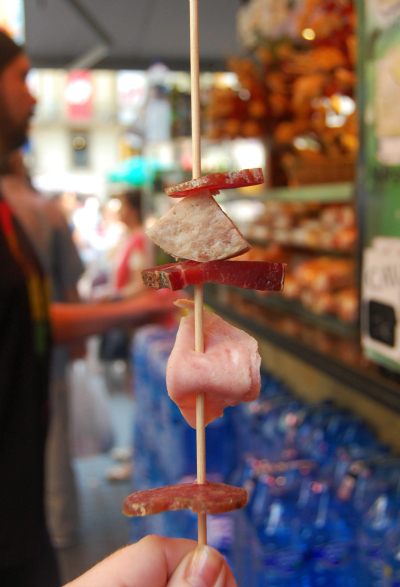 We quickly made our way to La Boqueria, considered one of the best markets in the world, it did not disappoint. Fresh fruits, vegetables, wine bars and many meats and cheeses I had never even heard of. One of the coolest things was the meat on a stick, can’t decide which meat you want,”BAM”… for 1 euro try a sampling of meat to-go! Also, I just have to throw this out there, McDonald’s in America, please take note. For 1 euro, at any MickeyD’s in Spain, you can get a Coke, Sweet Tea or… wait for it… A BEER! I just gave you your next big marketing push for the fall McDonald’s, the McRib and beer combo. Do you want that super-sized? … You bet your Hamburgler I do! Our next stop was La Sagrada Familia. A large, awe inspiring and still incomplete Catholic church that began construction in 1882. Pope Benedict XVI proclaimed it a minor basilica in November 2010 and is currently a UNESCO World Heritage Site. Gothic and beautiful, it is truly one of the most amazing pieces of architecture I have ever seen. 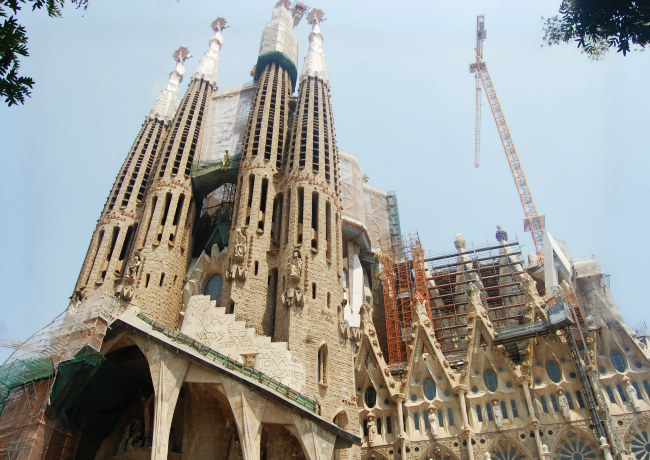 Completion is scheduled for 2026, the centennial of architect Antoni Gaudi’s death. If you’re ever in Barcelona, make it a must do. You have never seen anything like this…ever! Unfortunately we only had a few hours before we had to be back on the ship, but all in all the quick stop in Barcelona was beautiful and a lot of fun. A few weeks ago the family and I headed up to New Orleans for a great vacay. NOLA is one of my favorite cities … Great food, great people, just a great atmosphere in general. It’s easy to fall into all of the touristy stuff: Canal Street, Bourbon Street, St. Charles … you know, same old same old. The more I travel to New Orleans, the more local I want to get. I want to go to the places that no one talks about– because they don’t want you going there! Every town has their hidden gems, it just takes talking to the right people to find them. First, let me tell you about Magazine Street– It’s a short ride on the route 10 bus from Canal Street (NOLA buses are not what you think, and I KNOW what you think. I promise, there’s no weird pee smell!). Magazine Street is off the beaten path and ridiculously cool. Yeah, of course you run into the handle bar mustachioed hipster set here and there, but the trip is well worth it. Nestled between the vintage clothes stores and bars that seem to only serve Pabst Blue Ribbon in a can, is Dat Dog at 3336 Magazine St. – It’s simply amazing! You walk into the front door and are met with warm smiles and amazing smells. All the dogs are homemade … pork, beef, gator, German, Guinness flavored, duck and wait for it… Turducken. They also have some of the best “loaded fries” I’ve ever come across. You walk to the counter and are quickly told how to order and given a quick education about the different type of dogs. They also offer something really out there… “Chef’s Choice”. 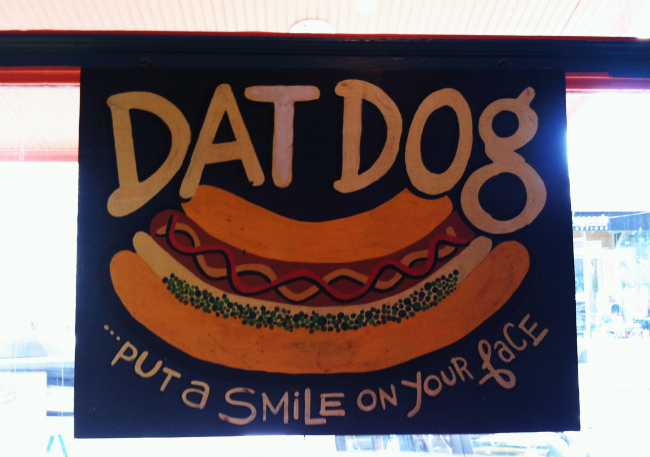 This is where you order a dog of your choice and then the Chef decides your toppings for you! All toppings are complimentary and there are a lot. I went with the “Bacon Werewolf”… simply money!! Fresh, crisp and delicious. They also have over 50 beers and create there own infused vodkas. 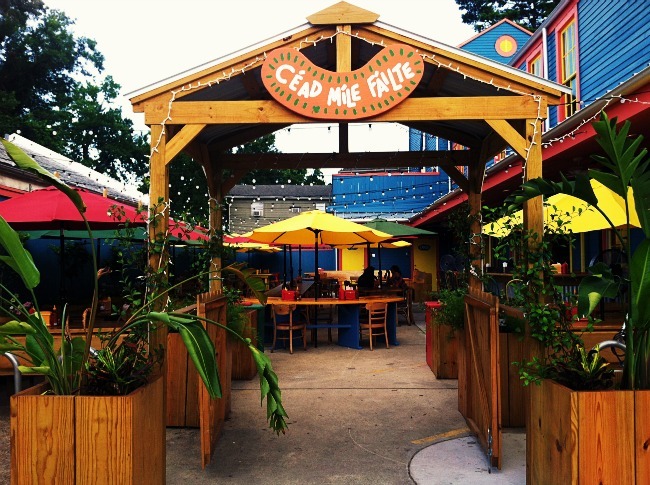 Try their selection of “Fat Tire” beers, which is a little slice of NOLA that is starting to hit other regions of the country as we speak. 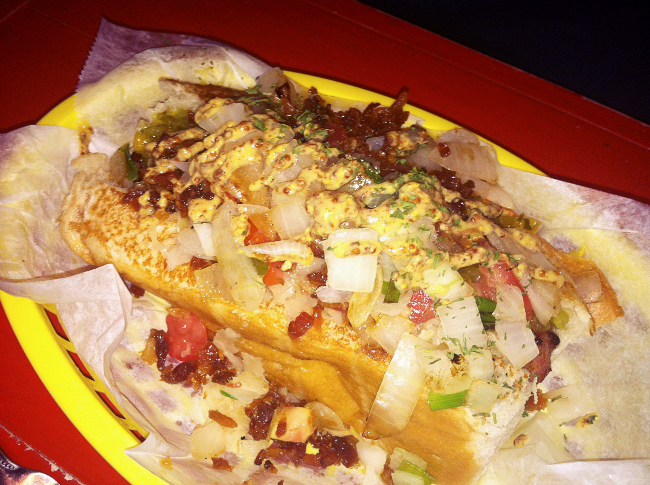 So, next time you’re in the “Big Easy”, travel the road less traveled… and check out “Dat Dog”. You can thank me later. 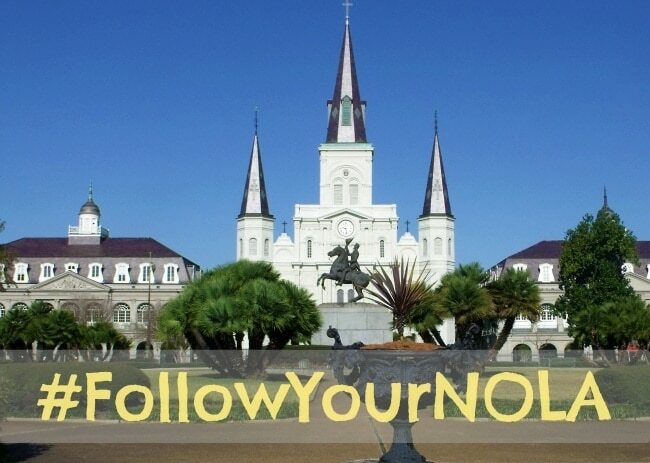 This Monday, the fam and I are heading back to one of my favorite cities…New Orleans. My pure love of “The Big Easy” didn’t come right away. My first trip took place during Mardi Gras when I was 28 years old… it wasn’t at all what I expected. After experiencing my first parade, the group I was with wasted no time and headed straight to Bourbon Street. The first thing I saw rounding the corner scarred me for life. 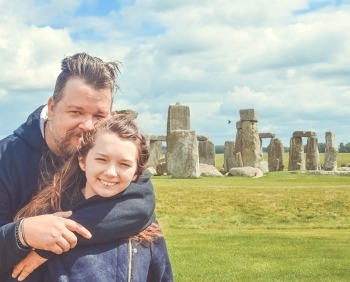 This being a somewhat family blog… I can’t go into details, but is was gross, real gross. I couldn’t really enjoy the rest of my trip and vowed to never go back. That next June I found myself driving in my 1983 Buick Regal Limited (Yes…I rocked a hoopty) down I-10 and thinking to myself, “Why am I going back?”. I’m glad I did. That trip started a love affair I’ve had with the city for almost 11 years. New Orleans in June was hot…real hot. I finally understood why almost every movie I’ve ever seen about New Orleans has someone wiping the back of their neck with some sort of handkerchief… did I mention it was hot!? Their weren’t any of the insane crowds or drunk college kids stumbling and bumbling around or any “WOO” girls…you know, the ones that scream “WOO” at anything that strikes their fancy as truly “Wooable”. New Orleans became beautiful, mysterious and almost perfect. New foods I had never tried seemed to be on every corner. Exotic drinks I had never heard of (No…not a hurricane. Try a Ramos Gin Fizz or a Bloody Mary from Brennan’s) truly washed away any previous bad experience I had. A visit to the Voodoo Museum provided thrills and a quick history lesson about the people of Louisiana. I truly began to fall in love with a “place”, an experience I had never had before. I’ve since taken my family to Mardi Gras and hung out with a Krewe on St.Charles St. for Lundi Gras. To truly experience this kind of party, you gotta hang with the locals. Great people, great food…Let The Good Times Roll Baby!!! So Monday I will board the plane knowing that sometimes the only cure for what I need is “New Orleans”.